Instore on iPad can be connected to optional hardware to extend the store experience. Below is a partial list of hardware components compatible with Instore. The stand and credit card reader connect directly to your iPad. 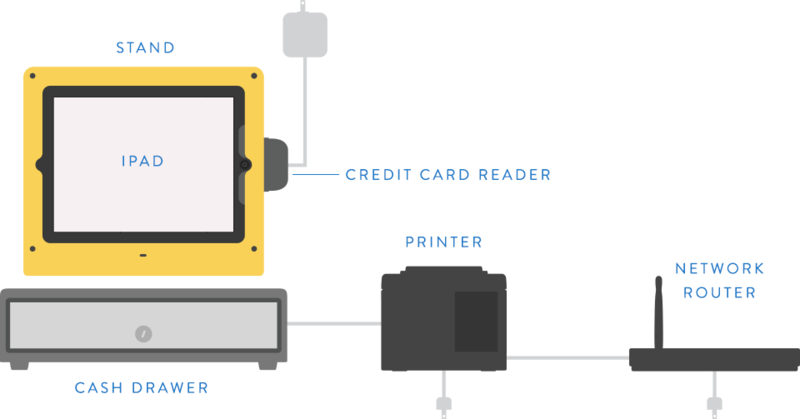 The cash drawer connects to your receipt printer, which with standalone printers connects to your wireless network router. The iPad then connects to your printer wirelessly. In addition to the hardware above, you will also want to have a network router in your store that broadcasts a wireless signal to be able to use wireless printing.